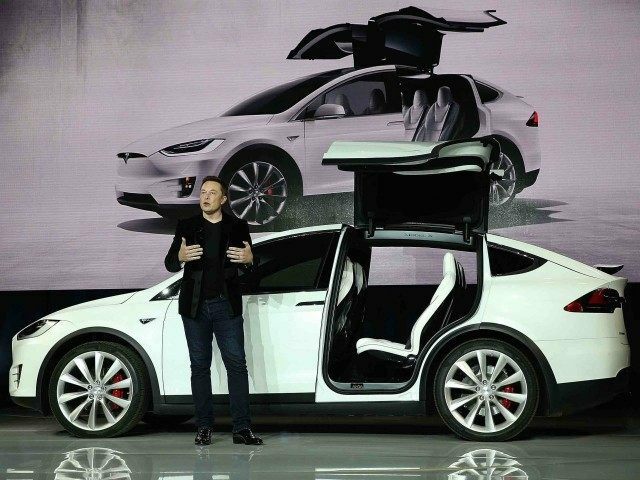 The Tesla Model X SUV was introduced earlier this week to rave reviews for its design touches, including rear “falcon-wing” doors that open upward for seven passengers. Tesla Motors and Musk set a new bar in luxury vehicles with the world’s first true all-electric SUV. The car maintains all of the premiums of Tesla’s iconic Model S sedan, but can also pin the family’s heads back at zero to 60 miles per hour in 3.2 seconds or tow a 5,000 lbs. boat. The Model X 90D base price is $132,000 and will travel 257 miles on a charge. The rocket-ship acceleration version costs $10,000 more and only loses 7 miles of range. Both the X and S feature the same 90 kilowatt-hour lithium ion battery and electric motors to produce 259 horsepower to the front wheels and 503 hp to the rear as the Model S. The S and X can both “quick charge” in 30 minutes at a Tesla station. Musk fully acknowledged that reaching the Model X introduction has been a winding road that began when Musk unveiled a prototype of “The X” in 2012 and promised that production and deliveries would be just 12 months away. The supposedly breakthrough vehicle seemed to be pushed back every 6 months. In a rare bit of humility, Musk admitted at the opening that in hindsight he should have made the design of The X easier to engineer and build. Tesla engineers designed The X with side hung “falcon” doors that make rear access for the back five passengers a pleasure. Originally designed with Mercedes 300 SL Gullwing style doors, the problem is that they need lots of set-back to open. Tesla engineers innovated around the problem by making a door that articulates and folds upward. With the use of proximity sensors, the doors only need 12 inches of clearance to open. The falcon doors open in about 6 seconds and use the same type of sensors on the bottom of the falcon doors to sense obstacles within 4 inches, and avoid bonking the kids on the head or smashing the owner’s hand. The car also can operate as a true SUV with the interior space to carry surfboards or plywood sheets, according to engineers. The X also comes with a Class 3 towing capacity hitch rated at up to 5,000 lbs. that can pull a trailer or convert with an attachment to carry up to four bikes or six pairs of skis. The X may be the first all-electric SUV, but it will soon have plug-in hybrid competition from BMW, Audi, Porsche, Aston Martin and Bentley.